The best stroke to lose weight is the one you perform best. When you swim efficiently, you waste less energy just staying afloat and you work out longer. Thrashing around doing a poorly executed butterfly will only exhaust you quickly and create turbulence around you. The number of calories you burn performing each of the four competitive strokes differs slightly due to the mechanics behind the movements. Freestyle is the fastest of all competitive strokes. You burn 704 calories per hour swimming fast freestyle if you weigh 155 lbs. Average lap swimmers can complete an hour swimming freestyle without becoming exhausted because it is an efficient stroke. You swim the freestyle on your side for most of the time, cutting through the water rather than pushing against it. Freestyle or front crawl is an upper-body dependent stroke, meaning you propel yourself primarily with your shoulders and upper back. When you swim for an entire hour, let your legs trail behind, kicking slowly. Although breaststroke is the slowest of all four competitive strokes, it burns as many calories per hour as swimming fast freestyle. 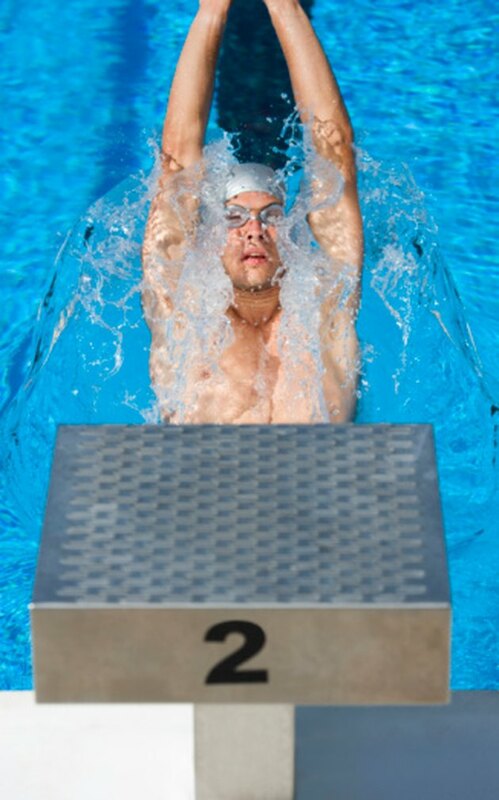 You burn 704 calories per hour swimming breaststroke if you weigh 155 lbs. You burn so many calories swimming breaststroke because it requires you to power through the water rather than cutting through the water. You face the water broadside when you swim breaststroke and the flat plane of your chest meets with water's resistance. You rely on your kick for propulsion in breaststroke and your large leg muscles are energy-hungry, making the breaststroke a slow-but-sure calorie burner. Backstroke might look like a breeze because you breathe out of the water facing upward, but it takes strong abdominal muscles and shoulders to swim backstroke well. You burn 493 calories per hour performing backstroke laps, fewer than the other strokes. Although you might not burn as many calories swimming backstroke as breaststroke, you might have better luck completing a long swim doing the backstroke. When you rotate your body during the stroke and keep your head aligned with your body, you conserve energy and swim longer. Butterfly is the calorie-burning winner, using up 774 calories per hour. You might not finish an hour swimming butterfly or even 400 m, though, because it is a difficult and demanding stroke. You must kick forcefully to move yourself forward and to propel your upper body above the water to breathe. Butterfly breaks down when you slow down and keeping up your speed and energy for long periods takes superb fitness and technique. Adult swimmers lose the flexibility required for butterfly and sometimes substitute breaststroke pull for the butterfly pull.